Through Smashed, the two artistic directors Kati Ylä-Hokkala and Sean Gandini present the world under an utterly subjective perspective, violently distorting reality to obtain an emotional effect and vividly transmitting their personal moods and ideas. Composed of tableaux vivants that give a sense of old photographs, echoing world wars, tense relationships, lost love and innocence, nostalgia and the quaintness of afternoon tea, this Bauschian Tanzjonglage performance culminates with a cathartic smashing of apples and breaking of crockery. Tour bookings: Various – Smashed has toured extensively across Europe and beyond; the company are currently at their 165th performance. 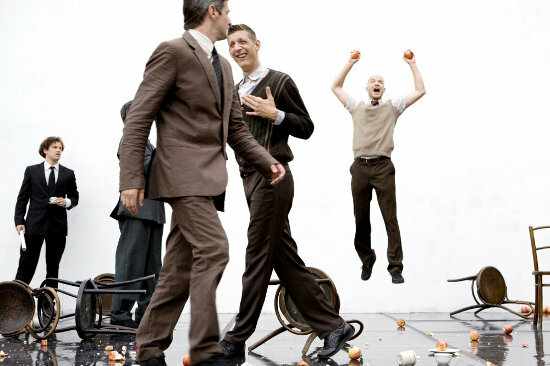 Gandini Juggling are taking Smashed to the Edinburgh Festival Fringe this August and are continuing to book tours throughout the EU to the end of 2013. They are seeking to book the show in the UK – mainly from 2014 onwards. Per show, the company require: 9 identical armless chairs with backs, preferably dark wooden, ideally not too modern, the older the better; 80 red apples; and a set per show of old-fashioned and kitsch crockery consisting of at least 2 teapots, 10 medium size plates, 10 cups and saucers, 1 vase or jug, and 2 decorations, such as vases, milk jugs, sugar bowls, cake stands, etc.